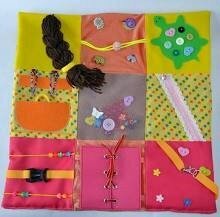 A Fidget Quilt provides sensory and tactile stimulation for the restless hands of someone with Alzheimers and /or other forms of dementia ADD or an autism spectrum disorder. The quilt is machined pieced using charm squares and embellished with buttons, hook and loop tape, prairie points, zippers and other fun add-ons. Some hand sewing will be required. All fabric is provided. Please bring your sewing machine and sewing supplies.